Dead Island for the PC actually allows some extended graphics options that are not available in the game menu. 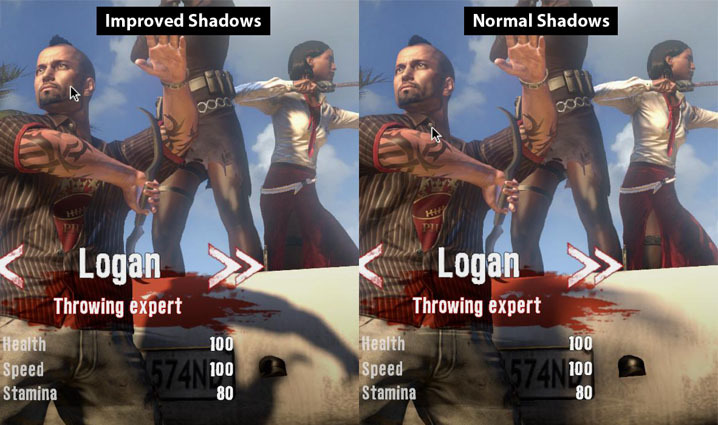 The additional options include adding anti aliasing in Dead Island and improving shadows. Here, I will show you how to quickly find and edit your graphics settings, even improving them over the best available options in the game menu. Solid Tip: This article can also be applied to the game’s audio settings. There are only a couple of options, though. The extended graphics settings are installed to your documents folder. To find your video file, simply open any Windows folder view and type the following: %userprofile%\Documents\DeadIsland\out\Settings\Video.scr. You will notice that this file has an extension of .scr and cannot simply be opened to edit. To get it open, you can either rename it temporarily to an .ini or .txt file, or simply open up a text editor program and drag the file into it. Update: Under the current version of the game, unfortunately, using a ShadowMapSize over 1024 causes a graphics glitch that is very annoying. Limit yourself to 1024/1024 for now. Solid Tip: Your ShaderPath for PC should be 3 (shader model 3) or 5 (shader model 4). Pick 5 if you have at least a GeForce 8600GT or Radeon HD 2600XT. Simply save the file when you are done editing it and make sure it is called video.scr. The game is sneaky and likes to overwrite your changes, so I recommend you right click the Video.scr file, select properties, then select the read-only attribute. This will keep the game from ruining your own settings. Ya, it may not be honoring the anti-aliasing setting (Haven’t extensively tested all options yet, so might be able to use Nvidia control panel for better AA). I was originally excited for the improved shadows until I saw the massive lighting glitches it causes past 1024. Besides, using Nvidia control panel to force Dead Island to run in Vsync and some other settings you prefer is much better. Made my GTX570 slow down and run almost silent, running at 60fps and 55c instead of 150+fps and 70c. The MaterialQuality, WaterQuality, GrassQuality, and FXFadeLevel should be set lower for better. FXQuality is higher for better. I’m going to update the article to reflect it. Thanks! Have you noticed any difference in using AA from the Control Panel? It’s not using 99% of the GPU with VSync enabled because it does not need to render more than 60 frames a second. It’s doing less work than when it is rendering 120+ fps with VSync off. Setting the FSAA(16) doesn’t do jack and the ShaderPath when set to 5 reverts back to 3. Also, I tried forcing AA in the Nvidia card settings and nothing. I use Nvidia Inspector so I’m gonna try now with forcing Antialiasing game compatibility DX9 to see if it works. I’ll keep you posted. Ya I have found that this file is mostly worthless. As far as the game changing your entries, I mention at the end of the article to make the .scr file read-only. This protects any changes you make. I did actually put it in read-only; I didn’t see any difference at all graphics-wise. I guess the engine does whatever it wants. Well, I tried forcing all the Dx9 and Dx10 AA profiles from Nvidia Inspector and none worked. I guess I will have to settle with getting the resolution up to 1920 x 1200. It really stinks when one dishes out big cash to get newer and better graphics cards to cope with Dx10 and Dx11 and it seems the technology is going backwards regarding AA. Older Dx9 games from 2009 and back look much better. Case and point: Left 4 Dead 2; this game I play at 1440 x 900 with 16x AA and it looks 3x better than Dead Island, AA, AF, shader and shadow wise (Half Life 2 Source engine FTW); IMHO. If you want someone to blame, blame the developers and/or publisher. Everyone is making games for consoles first and PC second. Therefore, when it comes over as a port, it has the crappy console graphics it started with. Where did you purchase the game? Hey, I know no one most likely reads this anymore, but thanks for the info. I already knew about much of it but didn’t realize that FXQuality only goes up to three, always set it to four, and was wondering why my game looked like crap. Hi I also searched for the video.scr file but I couldn’t find it. I purchased the game on steam.